Bipolar day celebrated in Kathmandu! 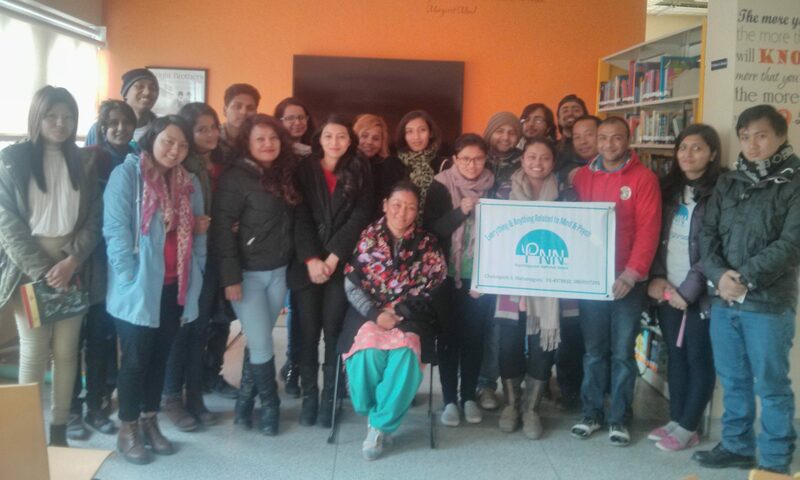 Nepal Mental Health Foundation (NMHF) celebrated Bipolar Day today at Yala Maya Kendra. The program lasted for 2 hours with presentations by 3 panelists and interactions in the presence of more than 30 participants who are active in the mental health. The program first initiated by Mr. Jagannath Lamichhane, NMHF, welcoming all the guests. The highlights of program was Presentation by Ms. Kathryn Goetzke, Behavioral Psychotherapist Franz-Josef Koch and Personal experience of Yalina Uprety. Ms. Kathryn Goetzke is a Global campaigner and entrepreneur. She is the CEO of Mood Factory, Chicago, USA, which is the social venture which also emphasize on helping people to give hope. She shared her personal experiences regarding mental illness, how it effected her father and then her. She also emphasized on the depression and how people stigmatized it without knowing that its treatable. She said the word depression is depressing in itself so we should make it cheerful rather than depressing. She explained that talking positive and talking about mental health is one good way to help reduce mental issues. She said her company also celebrates the ‘Global Day of Hope’ on May 2nd every year by planting sunflower (as the symbol of hope) everywhere. So, she appealed everyone to do the same to raise the hope. Likewise, the second panelist Franz-Josef Koch, Behavioral Psychotherapist, talked about symptoms of bipolar disorder. Bipolar disorder is a mental disorder characterized by periods of elevated mood and periods of depression. The elevated mood is significant and is known as mania or hypomania depending on the severity or whether there is psychosis. During mania an individual feels or acts abnormally happy, energetic, or irritable. They often make poorly thought out decisions with little regard to the consequences. The need for sleep is usually reduced. During periods of depression there may be crying, poor eye contact with others, and a negative outlook on life. The risk of suicide among those with the disorder is high at greater than 6% over 20 years, while self harm occurs in 30–40%. Frenz also stressed that being human we feel empty and active at times but we should not relate that as being bipolar. Diagnosis must be proper and effective to actually tell an individual having bipolar disorder or not. Psychotherapist must be non-judgmental and knowledgeable in order to detect this disorder properly. He also said that this is one of the mental condition, like other physical condition, so people must be more vocal about it so that it will be easier to detect and understand it. He also emphasized on the need of individuals motivation to be cured of this mental condition. He showed hope that one day all the people around the global would be more vocal about the mental illness. He concluded his presentation saying ‘Its not a problem when you have bipolar disorder like its not a problem when you have broken leg’’. Another panelist was Yalina Uprety, who said herself as having bipolar disorder and being vulnerable and under violence just because of this mental disorder. She explained her inner pain and bitter personal experience of how she got raped by relatives, victimized, outcasted from work by her poem and songs. She said that the physical abuse which she faced at the age of 9 led her to fall in the trap of depression while studying under graduation degree. Later after the three panelist finished sharing their knowledge and information regarding bipolar disorder, audiences came up with various questions regarding how to detect bipolar exactly, how to build rapport to clients and other signs, symptoms and preventative measures for bipolar disorder. The program conluded after snacks and bit of social chitchating. There is much need of talk and destigmatization of such issue. Then, only the real meaning of such celebration will be celebrated.